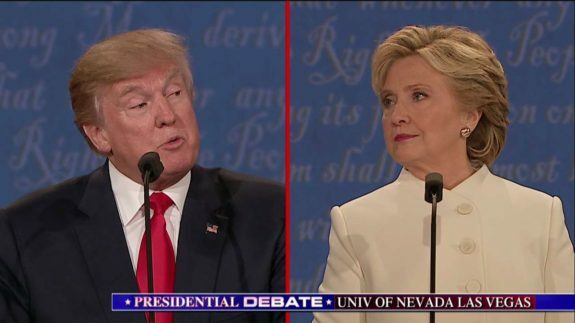 At the last debate, Hillary Clinton attempted to criticize Donald Trump for criticizing Ronald Reagan. Whereas it is true that Trump did criticize Reagan, Clinton hardly has room to chastise him. The criticism he leveled at Reagan was leftist and she would almost have certainly agreed with him at the time. She seems to have amnesia on her past stances just as she did while being interviewed by the FBI over her email scandal. Clinton was referencing an ad that Trump took out in 1987 and paid almost $100k for. He criticized US foreign policy in the New York Times, the Washington Post and the Boston Globe. The attack was launched to promote Trump’s book The Art of the Deal. Trump went after Reagan on… wait for it… his willingness to stand up to the Soviet Union. Even then, Trump was in bed with the Russians. He was advised at the time by none other than Roger Stone. “Why are these nations not paying the United States for the human lives and billions of dollars we are losing to protect their interests?” the ad continues. Instead of complaining about Mexico and China, it was the Japanese at that time for Trump. He said that we should not be defending countries who can afford to defend themselves. That part I agree with, but with a caveat… when it is in the national security interests of the US, we had better protect what significantly affects us or that we have strong interests in. Saying the Persian Gulf is of marginal significance is so far off the mark it shows a staggering lack of knowledge of geopolitics. To be fair, Trump also wrote that Democrat Jimmy Carter “couldn’t do the job” of president. He got that one right and that’s for sure. 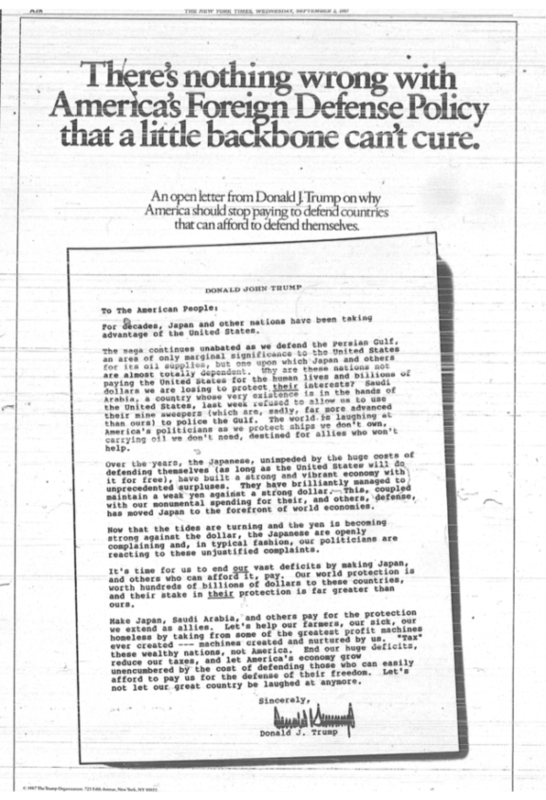 The ads came after Trump visited the Soviet Union and met with Mikhail Gorbachev. The media hated Reagan, as did the other leftists out there. Hillary knows this – she was in the thick of it. So, spare everyone the finger wagging at Trump. There’s enough blame to go all the way around here.